Japanese firm Teijin and Kansai University have developed a flexible, transparent piezoelectric material that demonstrates what it says are �unprecedented piezoelectric effects�. The new material comprises laminates of PLA, PLLA and optical isomer poly-D-lactic acid (PDLA) films. The piezoelectric effect is the generation of electric power in proportion to the strain produced when pressure is applied to certain materials, used in impact/vibration sensors. The inverse piezoelectric effect is the distortion caused by applying electric power, used in audio speakers, ultrasonic transducers and other actuators that convert electric energy into motion. Said to be the world�s first binary-blended PLA multilayer film with piezoelectric performance, it is said to surpass that of lead zirconate titanate (PZT), a conventional and widely used piezoelectric material, the new material. It is expected to pave the way for larger and more lightweight products that have been difficult to achieve. Going forward, the team will continue joint research and development aimed at achieving a wide range of applications, such as sensors that can detect pressure, vibration and impact, as well as ultrasonic motors, ultrasonic transducers for medical care and actuators used in devices such as speakers. 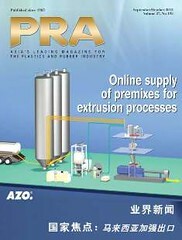 The new material can be manufactured with a simple and practical co-extrusion method. By alternately inserting positive and negative electrodes between PLLA and PDLA films, which exhibit piezoelectricity motion in opposite directions when exposed to electric fields of the same direction, the piezoelectricity motion can be aligned in the same direction. Piezoelectric performance can be controlled by varying the number of layers, enabling customized designs to suit specific needs. Research has revealed that when PLA exceeds a certain level of purity, piezoelectricity improves dramatically. In 2006, Teijin developed Biofront, a highly heat-resistant bioplastic with a melting point of over 210�C, by forming a stereocomplex structure from L-lactic acid and D-lactic acid. Work on new applications is ongoing. Until now, inorganic materials have been used widely as piezoelectric materials, particularly PZT because of its high piezoelectric performance. PZT is a designated hazardous substance that contains lead, but because there is no other material that can be used as a substitute, PZT is exempt from the EU directive that restricts the use of certain hazardous substances in electrical and electronic equipment. Also, because PZT is a ceramic material, it lacks flexibility and is difficult to increase its size or reduce its weight. Polyvinylidene fluoride (PVDF) is an organic-based piezoelectric material, but its action is weak due to an inverse piezoelectric effect. In addition, because PVDF generates an electric charge when exposed to heat, it is difficult to use PVDF as a material for electrical and electronic equipment, so applications are limited to sensors and such. To achieve piezoelectric effects, a direct-current, high electric field must be applied when manufacturing PVDF and PZT, so the process has a high energy load. In contrast, it is widely known that PLA films orient when drawn, so piezoelectric effects can be generated in a specific direction. However, this effect is short lived and a practical application level has not been reached. It is also known that when a drawn PLA film is laminated, the piezoelectric effect increases. However, because deformation (shearing) into a rhomboid shape occurs due to the piezoelectric effect, it is difficult to laminate the film into multilayers to generate a piezoelectric effect with a uniform direction. As a result, it has been difficult to adjust the number of layers, and continuous production of a multilayer film consisting of single-type PLA films has been a challenge.